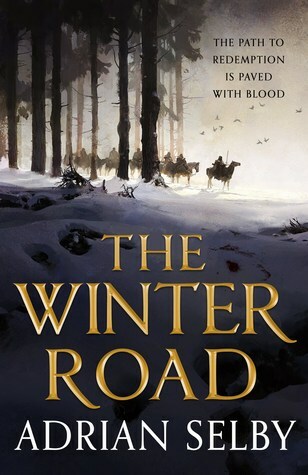 Thanks to Orbit and the author for an early finished copy of The Winter Road in exchange for an honest review. Receiving this advanced copy does not influence my thoughts or opinions on the novel, but loving Selby’s first novel, Snakewood, might have bumped it up a weensy bit. Also, just as an FYI, my review is a tiny bit spoilery if you haven’t read Snakewood, but it won’t ruin the read for you at all. Teyr Amondsen, ex-merc and mother, is on a mission. One no soul has ever attempted and lived to tell the tale. She is going to lead a merchant caravan across thousands of miles of dense forests and unruly clans, known as ‘The Circle’, in the hopes to unite them all and create a road. Accomplishing this is one thing, but doing so without the faith of your people, and knowing that a warlord across the wilderness, one with his own agenda, is gaining power and an army through sheer terror, Amondsen is in for more than she bargained for. She may be retired, but her prowess as a solider may be the only thing that can keep this foreign power at bay. Much like his first novel, Snakewood, The Winter Road is a standalone set in the same world. If you read Snakewood, you’ll remember an organization called ‘The Post’. The Winter Road, being a prequel of sorts, tells the origin story of its establishment, along with the far-fetched ambitions of its founder (which is, you guessed it, Teyr). While TWR isn’t as immersive as Snakewood was, what with dropping you into the action within minutes of starting the book and being written as an epistolary work, it is nonetheless captivating. Selby’s penchant for world-building and storytelling is astounding and I could live in his world for ages, though I’d probably be killed by White Boys or some brewed up merc looking for coin. TWR is written from a singular POV, so down a much straighter path than the author’s previous work, but Selby does throw in a wrinkle by interweaving past and present timelines. Having said that, he does so fluidly, climaxing in epic fashion. My favorite parts of TWR have to be the characters and the “brew” system. Amondsen is truly a character that you can stand behind and one you will ride the emotional roller coaster with again and again. Her selflessness, though you can say she is selfish in her ambitions, is not only a highly sought after character trait, but becomes a flaw for our hero throughout the novel. As far as the “brew” system, Selby brings it back into the fold without giving the reader too much of a history lesson but man is it ever in play during this adventure. The brews are not only useful for healing or poisoning, but can give enhanced vision or fighting prowess, be used as traps to incapacitate foes, or to downright murder someone. Though highly original in my eyes, you can see glimpses of a similar system in Angus Watson’s ‘West of West’ trilogy, but with animals instead of plants (another series I highly recommend. See my reviews for Book 1 and Book 2). All in all, if you read Snakewood (and enjoyed it), you’ll more than likely give The Winter Road a go. I would’ve given it a shot even if I hadn’t read Snakewood just based off of the gorgeous cover by Jaime Jones. If you enjoy High Fantasy with some grimdarkiness thrown in, I say you grab a copy. Looking forward to checking this one out. I had mixed feelings for his first book actually, so I’m curious how I’ll do with The Winter Road. Snakewood took me 3 restarts to get through, but once I got about 30% in, I was hooked. This one is much easier to get into. Hope you like it!